With the introduction of the iPad and other tablets and now touch screen computers like the Surface Pro and the Apple Pro, we seem to be moving further away from an exclusively keyboard/trackpad existence. Furthermore, with the introduction of Stylus Pens for tablets, is the keyboard on its way out completely? With an increase in the use of keyboard shortcuts and the average typing speed, maybe not. But with a new generation of children being raised with touchscreen devices, the keyboard-exclusive landscape of computer use is bound to change. In this episode of The Kennedy-Mighell Report Dennis Kennedy and Tom Mighell speculate on whether the pen or the finger is mightier than the keyboard. Is using a keyboard and mouse trackpad “normal”? Do you have to be a good typist to use a computer efficiently anymore? Why hasn’t the stylus replaced the legal pad? Is dictation the inevitable replacement for the keyboard, stylus, and finger? Tune in for Tom and Dennis’s take on the future of lawyers’ interactions with computers. In the second half of this podcast, Dennis and Tom discuss “cord cutting” or the practice of canceling cable subscriptions and replacing them with app consumption products like Apple TV, Google Chromecast, Roku, and Amazon Fire. Although neither host has “cut the cord,” they analyze the benefits of individual subscription based networks like Netflix, Hulu, or HBO Now and whether they offer a replacement or simply a supplement to traditional television. As always, stay tuned for Parting Shots, that one tip, website, or observation you can use the second the podcast ends. 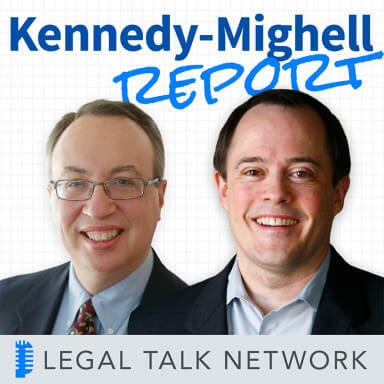 Dennis Kennedy: And welcome to episode 162 of the Kennedy-Mighell Report. I’m Dennis Kennedy in St. Louis. Dennis Kennedy: In our last episode, we discussed the return of ad blockers. We also talked about Tom’s new Windows Surface book, and that started us thinking about hybrid computers where you can use both keyboards and touch. Might we be seeing the beginning of the end of the keyboarding era? Tom, what’s on our agenda for this episode? Tom Mighell: Well Dennis, in this edition of the Kennedy-Mighell Report, we’ll be speculate on whether the pen or maybe even the finger is mightier than the keyboard. In our second segment, we’ll talk about the new Apple TV and its competitors; and as usual, we’ll finish up with our parting shots, that one tip, website or observation that you could start to use the second that this podcast is over. But first, let’s talk about keyboards, pens, styli and other ways that we have to input data these days. When the iPad came out five years ago, many people said we were entering the post PC era. I did, I talked about that in presentations all the time as people began to use more touch devices than desktops and laptops. We thought that they were going to start to go away. The really hasn’t happened. I think mobile phone use is through the roof. People are using their small mobile devices. I don’t think we’ve seen a true move to the post PC era. I still prefer my Surface book with the option of a keyboard to my iPad when it comes to being productive and using a device for work. Still though, I think we’ve been moving away from the keyboard over the past few years, and I think the Surface Pros and the iPad Pros are just more evidence of where we might be headed. Dennis, what got you interested in this topic? Dennis Kennedy: It was the little bit of conversation we had in the last podcast and that sort of stemmed from some observations I had from a couple of friends of ours who are using Windows laptops with touchscreens. And I watched them use it and ergonomically, it was appalling to me. But I could also see how for certain things, the ability to touch the screen is really a good thing. And with my new Macbook, my wife came up and wanted to do something and she reached on to the screen to try to do something and she couldn’t. So there is that notion of the hybrid device I think is really attractive and is becoming part of the expectation. And then I think of the conversation with the Surface book where it’s integrated with my iPad. I bought a keyboard to use, which I basically don’t use. And I find that more and more it’s the different types of input are really helpful to me and I don’t feel the need to keyboard all the time. Tom, you now have another few weeks on your Surface book. What are you finding about that sort of hybrid sets of both touch and keyboard? Tom Mighell: This actually started for me a while back, and it came to an interesting light. I think it was last week. Last week I was listening to MacBreak Weekly on the TWiT network, which we love all the podcasts that we have out there. But MacBreak Weekly talks about Apple and Mac; and one of the guests actually said that a Surface book and a Surface Pro, the way that they were designed were, “just not normal.” Apparently because people were not meant to touch the screen of a device that also has a keyboard. Leo Laporte, the host of that show, pushed back at that idea and I pushed back too, because I think that starting with the Surface Pro, which I used to have, now moving to the Surface book, I am finding that the way that I use my keyboard has changed. More accurately, I should say that the way that I sue a mouse or a trackpad has changed. When I’m reviewing something, I find myself frequently moving to the screen to scroll rather than to go to the trackpad to position my mouse somewhere. It’s just more convenient for me to use my finger on the screen to move down. I just started doing it. I think it has a lot to do with my use of the iPad and what I’m used to with touchscreens. Now it’s second nature on the Surface book. But you say that your wife goes and does the same with a Macbook. I think we’re seeing hat with kids who have been given a smartphone or a tablet and they like the touchscreen and they automatically assume that everything’s going to have that ease of interactivity that you can get to it. And for me, that’s exactly how it was. So I don’t think it’s not not normal at all. I think it’s a natural evolution of how people use it. Though I think we’re going to talk here in a little bit about the limitations of keyboarding and those types of things. But for me, it’s been a natural progression. Dennis Kennedy: And then I always say what’s so darn normal about a qwerty keyboard anyway? Why have we decided that’s the normal way we should interact with a device? From the typewriter days, it was designed as a way to slow fast typists down. And so I think the notion that keyboarding is the way that you interact with a computing device I think has always been open to question. And because we’ve never had more choices that really work well now, I think that brought it into the forefront. You also see in the keyboarding area, I think people can now gravitate to keyboards that make more sense to them. And so there are real keyboards and there are virtual keyboards. I was talking to somebody who said they replaced old computers in an office and the big concern was – and they were very old computers – the concerns of the people who have been there for a long time is they wanted their old, big keyboards that had a response and clicked and did all of that. I want just the opposite. I love this keyboard on my Macbook, which the keys hardly move at all and it doesn’t have the same type of response. So I think you have people who grew up as touch typists and they’re very fast and so they want certain types of things. There’s virtual keyboards. The way we type on an iPad or a tablet is different than we would on a keyboard. To me, at this point I’m sort of like whatever keyboard’s in front of me is fine. But I’m not a typist so I like alternatives to the keyboard. So there’s that one aspect, I’m not sure the keyboard is all that normal. And you’re right, when you look at kids, they go right to gestures on devices. It’s hard for me to imagine that somebody who starts at the age of two with gestures is going to have an easy transition to keyboards some time in the future. Tom Mighell: I’m not here to defend the keyboard necessarily, but I do want to point out that I think there are so many articles out there about trying to get you to use your keyboard more, keyboard shortcuts to make it easier to work, so the idea is your hands don’t have to leave the keyboard very often. And I see many articles about how it’s hard to be productive when you’re constantly having to reach up and move your mouse or put the touchscreen, that if you can just do a quick keyboard shortcut, then you can actually be a lot more productive. So this discussion that we’re having sort of flies in the face of that general wisdom of keeping your hands on the keyboard. I see this movement away from the keyboard as benefiting the people who don’t use shortcuts, who don’t rely on the keyboard as much. But then you say that we’re moving away from the keyboard and here goes Blackberry, and they released the Blackberry PRIV within the last week. It’s an Android phone, but it has a slideout keyboard like Blackberry users are supposed to be using. And frankly, I’ve heard not great reviews to this is one of the best Blackberry/Android phones you could get. But I still say if there is a movement away from keyboards, not everybody is going the moving. Dennis Kennedy: That’s why I think we’re at the beginning of something, and your point about keyboard shortcuts is actually a great one because I find now that I use keyboard shortcuts more than ever before. So I think I use more mouse right click. Now I have like a group of keyboard shortcuts and I’m looking for more ways to get more bang for the buck with what I use the keyboard for. So now I’m looking at more macros and what can I do on the keyboard that will trigger a result that I want in the shortest time in the easiest way. I think we struggle a bit with the keyboard shortcuts because when you say all you need to do is a control shift T to do something, it never does seem that easy. But now I may have 12 or 15 more keyboard shortcuts that I use on a regular basis where maybe five or six years ago I might have been using literally a couple of them. So I would say we’re at the beginning of the keyboarding thing and then also more evidence to that personalization thing we talked about where you see there’s a bunch of different ways to input data or text or commands into a computing device. And a keyboard might be the right thing for some things, it might always be the right thing for some people, and for other people it might be something that you could almost dispense with. Tom Mighell: And to answer one of the questions I think you had a second ago which is do you have to be a good typist to use a keyboard. I think we’re finding more and more you don’t have to be a good typist. Certainly, people who don’t type very fast may be wanting to gravitate towards voice recognition which I think we’ll talk about in a minute. But those who do type reasonably fast but just not reasonably well, I think that technology has made it so much easier. I think it’s less important to be a good typist these days and more important to be a good proofreader, because autocorrect, no matter what format you’re in, really makes most of our typing free of misspelling for the most part, but not necessarily putting the right words in and that’s why paying attention I think is important. I would say that on my Android device, I use swiftkey on my phone to swipe out words using the keyboard and it’s really accurate how it gets what I’m swiping as well as predicting the next couple of words that I want to say. So I very rarely will actually be typing something out using a phone keyboard. I found that swiping that information is a lot more efficient, gets things done a lot faster. So I like the way technology is heading in the direction with the keyboard so it forgets against your ability to use the keyboard and helps out those who are less adept. Dennis Kennedy: That prediction feature I think is great because on the phones it makes such a big difference and it’s gotten so much better that it’s surprising how sometimes you can go and almost get the whole sentence in just from the suggested words. It’s pretty amazing, it’s very helpful. Then when I go back to a regular computer, I’m wishing it would be suggesting the words so I didn’t have to type them. So what I find on email is that I’m going more toward voice, which I think is great. The voice instant messages on an Apple watch is pretty darn cool, and it works really well. The predictive typing is also great and I get around definitely the issues you have with a small keyboard. Also on the watch and elsewhere, there are suggested responses. So you can say all I want to do here is say, “Okay,” or, “Good” or, “See you there,” that sort of thing and boom, I just pick that and I’m done. We’re eliminating some of the issues, the chance to introduce typos, and all those sorts of things. Also they’re very minor savings but it seems like they make a ton of difference and make you feel like you may not necessarily need that keyboard as the primary input device. Tom Mighell: I think it definitely makes a big difference. I think that a lot of people are still using tools like Dragon Dictation, just to name one. I know some of our good friends use it. People who generally aren’t very good at typing or they’ve got a lot of stuff that they need to set down and text and typing just slows things down. I think with the rise of tools like the Amazon Echo and Siri and the ability to hear your voice, I think that speech recognition has improved to the extent that these tools are just going to get better. They’re going to get better and they’re going to be more accurate and more powerful. Sure, I see a huge growth market in voice dictation but I may be wrong about that. Maybe tools like the Echo kind of are foretelling that we’re going to start using our voice a whole lot more. But I just don’t see a terms of legal technology seminars, I don’t see a ton of sessions on how to use voice dictation. It just doesn’t seem to be one of the hot topics for me, I don’t know about you. Dennis Kennedy: I still think people are looking at dictation for the sort of perfect transcription approach, and I don’t know that that’s still realistic. I think it’s very good right now. What speech is really interesting for is commands and actions and simple responses. Dictating a quick answer to an email that pretty much gets it on the first try is great, but if I say I have to write a 2,500 word article so I’m going to dictate it. I still think that probably by the time I clean that up, it would be easier for me to type that than dictate it. So I think there’s that and if you say you’re talking to lawyers and you’re saying here’s something that could be really helpful to you, I don’t know if you’d ever do a whole session on voice recognition anymore. But I could see that you would say as part of some productivity improvements, this is something to consider. I think you can give some examples where it becomes really interesting. So there’s this speech thing and i think we’ll see more of that. Speech recognition’s been around forever, but I think we’re in a new phase for it and a quite interesting one and how it works in combination with other things is great. I also think that whether you want to call it macros or automated text or whatever that I think I’m a good typist but I’m certainly not a fast typist. But I know that if I could do certain things where I can say put the salutation in, put the closing in, put the paragraph about this in, and that triggers the input of text just by that, I know there’s nobody that can type that text in faster than it going in automatically when it’s already been pre-prepared. So I think that combination of voice to insert pre-done sections of text and letters and formatting and things like that I think is another interesting area. So I sort of see speech as a helper where it becomes most interesting rather than speech as the primary vehicle. Tom Mighell: So we’ve been talking about voice, we’ve been talking about keyboards. Let’s switch gears; let’s talk about the stylus or the pencil as Apple is calling theirs or maybe I should just say pencil. Dennis, do you use a stylus at all when working with a tablet? Dennis Kennedy: I really don’t right now but I wish that I did whenever somebody asks me to sign something. And I also see when I would want to draw, say using OneNote or something like that, that’s where I think the stylus or pencil would be great. Back what seems like years and years ago when I used an HP tablet PC, I really liked using a stylus. I thought it was great for a lot of purposes; I don’t use a stylus now. If I want to the iPad Pro, that new pencil is interesting. And Tom, I know you’ve used styluses on iPads probably more than anyone I know. You’re always reviewing some new one that you’re trying. My thing with the stylus is I think it’s potentially really interesting. I think it’s great to do markup in the sense of editing and redlining in the sense of changes. I think it’s great to do mind mapping, drawing those sorts of things. I think that my issue always with the stylus is how comfortable it is to use and how easy it is to lose. Tom Mighell: I’m not really a huge stylus user either, but I really wanted to be. When the iPad first came out, I saw it as a replacement for the legal pad. I was really looking forward to using it for writing. That’s something that I really like to do, but it really doesn’t work out that way, one because I’m not a really good writer, I’m a much better typist. But I also didn’t really like the different styli that I tried. They were mushy, they felt a little bit like writing with a crayon. The experience just wasn’t all that enjoyable to me. What’s interesting, though, is that the new devices that are coming out really feel like you’re using a real pen or a pencil. They tend to be more precise, they tend to use more technology; so they’re using thousands of touchpoints so it really interacts with the screen that you’re touching. I think the Apple pencil, the Surface styli, are getting really good reviews. I find it actually kind of amusing that one of the best features of the Surface stylus is that the tip of it is an eraser, and Apple’s pencil doesn’t even have an eraser, but I digress. The use case for the stylus for me is a little different because like I said, I’m not a good writer. I type much faster; it’s easier for me to get things down if I’m typing. Where I find writing comes in handy is when I’m really trying to listen to someone. I think it’s so much less distracting to be writing with a stylus than clacking away on a keyboard with my eyes often down. It helps you to pay attention when you’re writing. With a keyboard, I sometimes have to pay attention hitting the right keys and I think that writing takes some of that pressure off. I’ve been able to take some great handwritten notes in OneNote, which I think is a great feature. But I will say that another advantage that the Surface has over the iPad s that you can actually use a stylus in any app. It doesn’t matter which app you use, and it will convert your handwriting to text. It’s just that handwriting is another keyboard. You can select the handwriting box as a keyboard and it will write in that and automatically converts your handwriting to text. The iPad really can’t offer that kind of flexibility because it’s pretty on an app by app basis where the Surface is a computer so it allows that feature on an operating system basis. Dennis Kennedy: That combination of OneNote with the stylus for taking notes I think is just an amazing combination. Tom Mighell: For everybody, just for anybody; I totally agree. Dennis Kennedy: So I think all of these things are sort of physical approaches and I’ve been reading a bit more and doing a little bit of experimenting with what’s known as the accessibility features in programs and on computers. So these are the things that are designed to help people who have some kind of inability to do something. So people who can’t hear, people who are blind, people who have other issues. And some of these features are built into different programs in devices into the operating system. I’ve read a couple of articles about poking around there and when you think about it, there are features designed to enable people to do things who don’t really have the ability to do it in the usual way with the keyboard or something. And some of the tools in there I think are potentially really interesting for the rest of us to explore. I don’t know that I have a great example because I’m just taking a look at it now, but I think that poking around in there in those sets of features, you may find some things. I learned this early on with OneNote, being left handed. You can set it up so that it favors left handed people. They also have a watch that does that so you can set it up on either wrist. There are a number of things in there that might seem small, and in other cases they might seem really significant, but you can make adjustments to make your approach to all of this a whole lot easier. Tom Mighell: I think there are a number of really useful accessibility features that anybody can enable. You can invert the screen so that the background is dark and the text is light if reading on a white background hurts your eyes. You can have the text on basically any screen in any app read to you. You can also configure autocorrect so that it reads out text corrections, which I think is useful, especially if it’s autocorrecting to embarrassing terms. There’s a lot in there if you go exploring. Dennis Kennedy: I’m actually quite enthused by a lot of this and especially the accessibility piece and also the ability to personalize to what it is that I do better or you do better. So for me, the more I can move away to accommodate my less than stellar typing skills to something that works better, that’s really attractive to me. There’s clearly some things out there that if you listen to the podcasts that we do, Tom, the virtual reality stuff people are just raving about. So that seems like there could be some things coming along those lines to help us input control into devices. It would be weird with the big goggles over our eyes, but if you look a ways down that road and people are also looking at control by eye movement; the Google Glass thing, being able to control things out of glasses. People are looking at ways that you could control devices with your thoughts and those sorts of things, so those are probably faster than we think, there’s a lot of stuff out there. Those things, I don’t see a lot of lawyers using that in the near future, frankly. But the other things, OneNote and the stylus, voice recognition for commands, more use of what I call macros or automated text, keyboard shortcuts, different approaches, different styles of keyboard; so not buying the same keyboard for everybody in the firm, those sorts of things. There’s where I think you can benefit and I think the benefits come from personalization; and we asked the question in the beginning Tom if the pen is mightier than the keyboard. Probably not yet, but in some cases I think it’s starting to get interesting. Tom Mighell: I agree. For me, I think the practicality is what’s most important, the ability to get things done. So it’s going to be different for everyone, whether it’s a keyboard, whether it’s a stylus, that’s going to help you get your words onto a device. It will be a matter of what you prefer, what you want to do. But what’s good about what we’re seeing is there are a lot of options already out there already to choose from, and I’m guessing there are going to be a lot more coming in the near future. So choose one. Choose an option for one of these, get good at it. But really keep your eyes open; don’t be surprised if something new and better is just around the corner. Before we move onto our next segment, let’s take a quick break for a message from our sponsor. Advertiser: Looking for a process server you can trust? Serve-Now.com is a nationwide network of local, prescreened process servers. Serve-Now works with the most professional process servers in the industry. Connecting your firm with process servers who embrace technology, have experience with high-volume serves and understand the litigation process and rules of properly effectuating service. Find a prescreened process server today. visit www.Serve-Now.com. We’re glad you’re listening to Legal Talk Network. Check us out on Facebook, Twitter, and LinkedIn too. Tom Mighell: I’m Tom Mighell. Dennis Kennedy: And I’m Dennis Kennedy. The newest version of the Apple TV has just come out and there’s a flurry of interest because of it. Tom and I love TV, frankly, and we think the new TV control devices are especially interesting today. There are a number of them to consider, and cord cutting has become a popular topic. Tom, there are a number of choices out here, not just Apple TV. What’s your current thinking of these devices? Tom Mighell: Well, the latest version of the Apple TV represents a new way of thinking about cord cutting devices. When he introduced it, Tim Cook mentioned that the future is apps, and the Apple TV really takes advantage of that. When you set it up, you basically just get a blank screen and an icon for the app store. You may have some very basic apps that are a part of it, but it’s almost like opening up a phone for the first time, like an iPhone. But then you can download and install the apps you want: Netflix, Hulu, NFL, Major League Baseball, apps for specific television networks. There’s tons of games you can download, apps to view photos, maps, like I said games, that sort of thing. There’s apparently a lot of apps available for Apple TV. It’s also supposed to represent a significant move forward in the voice commands. There’s a version of Siri that’s a little bit different because this Siri doesn’t talk to you, it just listens. But you can ask the Apple TV to, for example, “Show me the episode of Friends with Brad Pitt.” And it’s going to search out and it will find that episode no matter what service it happens to be on, whether it’s Netflix or Hulu, or whatever service you happen to have installed as an app on your Apple TV. Really though, I think the Apple TV isn’t a ton different in format from others that are out there. The Roku, Amazon Fire TV, the Google Chromecast. They all provide similar service, and quite frankly, at somewhat reduced cost. Apple TV might have the most polished experience, but really if you’re looking to cut the cord, I don’t think you can go wrong with any of them, frankly. But I think the real question is what would you use these for, really? I use them for two main things: I mostly watch movies and I watch television series that aren’t on the major networks. That’s my primary usage, things like Netflix, Hulu, Amazon; they’re coming out with a lot of original program that’s really very good and that’s my primary use of tools like this. But I am still not a cord cutter. I still watch more TV than these apps are able to accommodate. I still like to watch my sports live so I’m not quite ready to go there yet. And I think that these services aren’t quite there yet, but for me they really serve as an excellent, supplemental entertainment source. Dennis Kennedy: I became really interested in cord cutting and that also we were talking last time about ads and we haven’t talked about this Tom, but there’s a show we both watch from time to time called Project Runway. And in the finale, people were logging at 9 minute commercial breaks in the finale show. Often you’re seeing four and five minute commercial breaks, so you start to say what the heck am I watching here if I don’t DVR this. And if I’m DVRing it, why do I need live TV in the cable form and if you can improve the search thing so I can find things that I actually want to watch, then maybe I don’t really need cable other than the wildcard of sports – but there are starting to be alternatives for that too. And maybe what I want is this sort of a la carte approach to TV that one of these boxes provides. Then I say I’m interested in Apple TV, which I think is the most expensive option, because of the potential app platform. So it seems like a platform buy. But on the other hand, I know that for a very small percentage of the price you’re paying for an Apple TV – I think it’s $30 versus $50 – you can get the Chromecast. And I think, Tom, you use the Chromecast when you’re travelling as a way to access TV. But I know other people use that as sort of an approach. So I looked at it and I said maybe it is the time where I buy a fast internet connection and get rid of the cable and do the cord cutting and use one of the devices. Maybe it’s not here right now but maybe in a year or two it is and maybe I just have a better experience and it costs me less to get more of the stuff that I like. Tom Mighell: So you talk about commercials on Project Runway, and I guess in addition to outing me – Thank you, Dennis – as a Project Runway fan, I will also admit that I like the reality show The Amazing Race. Just for an example, a couple of weeks ago we missed an episode. We tried to go back and watch it. The CBS app requires that you be a subscriber to CBS All Access to be able to see that episode. I thought, okay, I really want to see it I’ll go ahead and subscribe. It’s $5.99 a month, which really, in the scheme of things, is not a huge amount of money. But frankly, I would expect that for $5.99 a month, I’m either going to get no ads or limited ads. I got full length commercials throughout the entire show, had to sit through an hour long show for 6 bucks. It’s 6 bucks, but still, if I’m paying I really expect not to have those kinds of ads. When it comes to cord cutting on the road, I’m really still relying on the Roku stick. I think it’s the easiest to use right now and it can connect me to all the services that I need when hotel TV just isn’t showing anything that’s interesting. Dennis Kennedy: And then I think the other thing that’s worth mentioning – because it is a very cool thing about these – is mirroring onto a TV what’s on your device, and there are many different ways to do that. But the idea that you can throw photos, if you’re a lawyer that you could do presentations and stuff off a tablet onto a big screen TV using these devices is another reason to explore them. And then, as an example of what you might use on Apple TV or similar device for, to make yourself familiar with the notion of something called binge watching. I was watching a show called Longmire on Netflix, season 4, ten episodes. This show was on A&E for the first three seasons based on a series of novels about a detective in Wyoming by Craig Johnson. Great series of books and a great show, and it seemed like it was really hitting its stride at the end of the third season and then A&E cancelled it. They were able to keep the actors together, keep the show together and do a new season on Netflix and then it drops all ten episodes. And then you can watch them, actually, without commercials. And instead of having 43 minutes to do an hour show with commercials, the shows run about an hour, so the stories are better ,they’re more complex, and you don’t lose a show that you really like. So I fell right into it and watched all ten of them. It’s a great series, four seasons; definitely if you’re looking for some really interesting television with a little bit of Western flavor, I highly recommend the show. And now it’s time for our parting shots, that one tip, website or observation you could start to use the second this podcast ends. Tom, take it away. Tom Mighell: My parting shot is Earbud.FM. I’ve been talking lately about podcast parting shots and here’s another one. Earbud.FM is from National Public Radio, and it’s an attempt to curate great episodes of popular podcasts. Now to be fair, a lot of them on here are National Public Radio shows, but they actually go out and they find other podcasts worth listening to and they divide them up into different categories. So you can have what celebrities choose. You can just look up for things like beauty or entertainment or news or sports. And they will go and not necessarily select podcasts in general, but they’ll select specific episodes of podcasts that they think are interesting or have value for you to listen to. So they’re kind of your curated version and they send out an email each week to let you know what new podcast happens to be available. I think it’s a great new way to discover podcasts. Earbud.FM. So that wraps it up for this edition of the Kennedy-Mighell Report. Thanks for joining us on the podcast; information on how to get in touch with us, as well as links to all the topics we discussed today, is available on our show notes blog at TKMReport.com. If you like what you hear, please subscribe to our podcast in iTunes or on the Legal Talk Network site where you can find archives to all of our previous podcasts. If you’d like to get in touch with us, please email us at [email protected] or send us a tweet. I’m @TomMighell and Dennis is @DennisKennedy. So until the next podcast, I am Tom Mighell.